We’d love your help. Let us know what’s wrong with this preview of Torches of Joy by John Dekker. To ask other readers questions about Torches of Joy, please sign up. It drags in places, but is an amazing biographical account of the Dekkers missionary work with the Dani tribe in PNG. This book was great and follows the transformation of the life of John Dekker, how he met his wife Helen (really cute story), and how God led them to become missionaries to the remote Dani tribe that most people stayed away from! What I really loved about this book is that God is what truly changed the Dani people. The missionaries did not try to change their culture at all, and just wanted to help them learn about Jesus and change their evil ways (such as being war hungry, not really caring for This book was great and follows the transformation of the life of John Dekker, how he met his wife Helen (really cute story), and how God led them to become missionaries to the remote Dani tribe that most people stayed away from! What I really loved about this book is that God is what truly changed the Dani people. The missionaries did not try to change their culture at all, and just wanted to help them learn about Jesus and change their evil ways (such as being war hungry, not really caring for their wives, ad being Animists who were superstitious about many things). Torches of Joy is a very challenging, encouraging book. It is challenging in that it clearly lays out the responsibility of the believer to spread the Gospel; it is encouraging in that it shows how lives are changed by the Gospel. 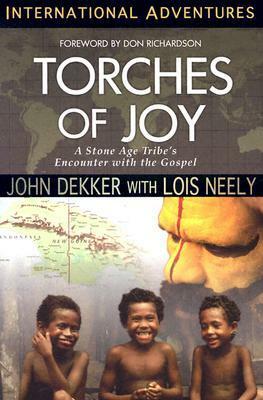 In 1960, John and Helen Dekker went to New Guinea to live among the Dani people. This is the real life story of John and Helen Dekker's ministry to the Dani people in the Toli River Valley in Iran Jaya. What a wonderful account of the Dani's first contact with the Gospel of Christ. I was amazed at how the Gospel spread like wildfire from this primitive tribe to others in and outside of the area. God truly transforms our lives when we come to know Him. While not expertly written and dragging in some parts, torches of Joy is still a good read. The amazement of seeing what God can do in such a remote area over powers any deficiency in the authors style. This book follows John and Helen Dekker through their 20-year missionary experience in Indonesia. The writing style is not very good, but the (true!) story is wonderful. The works of God described in this book are amazing to read about. This is one of my favorite missionary books. This was a great story of reaching the unsaved tribes in the Toli Valley. 25,000 tribespeople were introduced to Christ by the works of John & Helen Dekker, through the Dani new Christians. I liked the unusual cultural insights in this book. Didn't care for the writing style. The book started out well and then seemed to get lost somewhere and didn't flow anymore. So super duper boring and not at all well written. It was an interesting story, but the author basically has no writing talent whatsoever. No offence. Amazing story. So inspiring and encouraging. The power of the gospel is without measure. This book is certainly inspiring. It starts up really strongly and then I think it kind of splinters apart. We are really enjoying this book so far. Missionary biographies are a favorite with my daughter. She likens this book about the Dani's of Iryan Jaya with the story of Bruchko (Bruce Olson). This is an excellent and powerful read. What I especially appreciate is its example of evangelism that focuses on speaking of Jesus and the Bible and not propagating Western culture. The approach focused on training up indigenous leaders, spreading literacy, and indigenous leaders then becoming missionaries to surrounding tribes.